For the last couple of days, I've been plugging away at several projects around the house. Unfortunately, very few of them are share-worthy. . . and today, one of them even involved peal and stick floor tiles, being used as floor tile. This type of floor tile should never really be used in a home unless it's an extreme circumstance...like you think you have hardwood floors in an entire room so you happily rip up all the ugly flooring above with no back up plan at all because...well, what could possibly go wrong??? At some point three layers of floor ago, there was a leak in the pipes and the entire section of flooring under the tub was removed to fix it and replaced with standard subflooring. That means I only have half a bathroom of jacked up original flooring. So until I come up with a realistic plan B, the sticky floor was the 911 solution. After this fiasco, I needed to do something to lighten my mood like burning my finger tips off with a hot glue gun. I hit the dollar store for inspiration and was hit with a wave of summer goodies. Its in the mid 80s already here, so you have about 6 weeks left to go until I start to complain about the miserable humidity. I started with a pool noodle and tape. 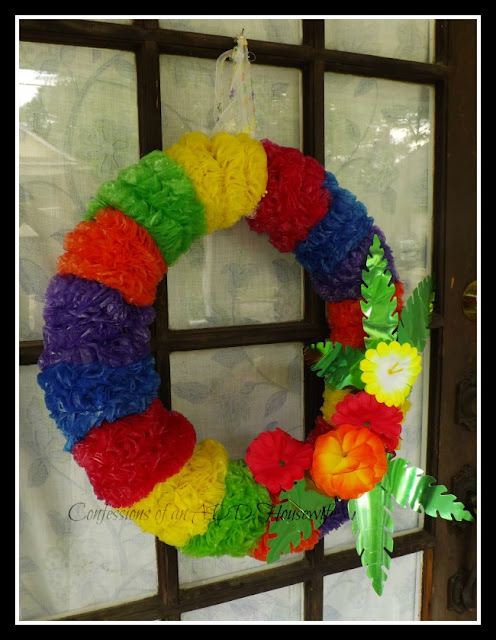 It's a very inexpensive way to get a large foam wreath. Next, I wrapped 24 leis around the noodle. At one point, it started to look like Bozo the Clown. I was a bit worried. I took apart a palm tree center piece and used just the leaf portions and glued the flowers from several hair clips. So now my door is decorated for early summer. Little Miss tells me it looks awesome. oh my gosh, you are HYSTERICAL! I love this post, I love the jacked up scratched out......I love the WREATH! yea, you! How creative and cute! Haha, I always start to get worried about 1/4 of the way into making a wreath...but things always tend to look brighter once it gets finished! I love it. Too cute~ What a great idea using the leis! Super cute for a luau party! 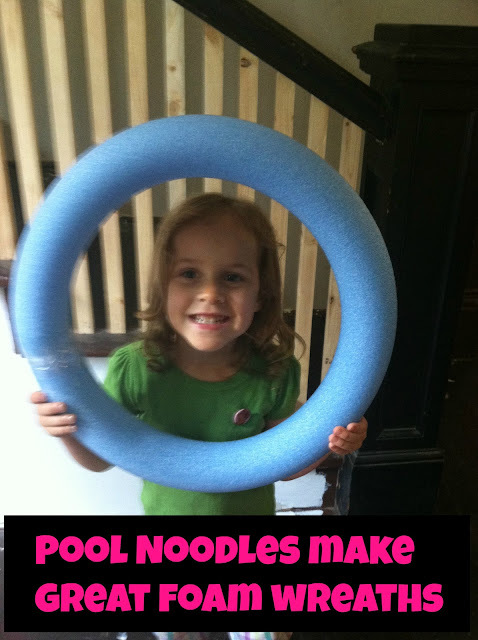 Thanks for linking up on Made in a Day!